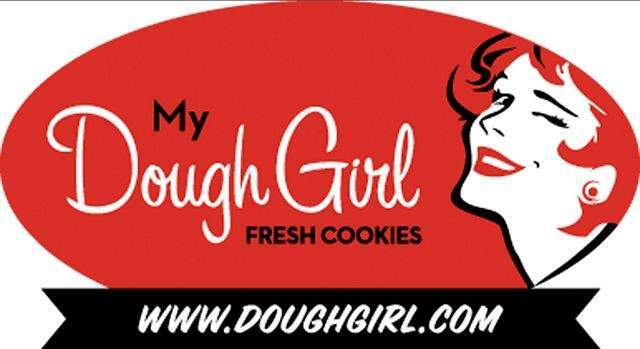 This photo provided Tuesday by Tami Cromar shows her companys logo for My Dough Girl. 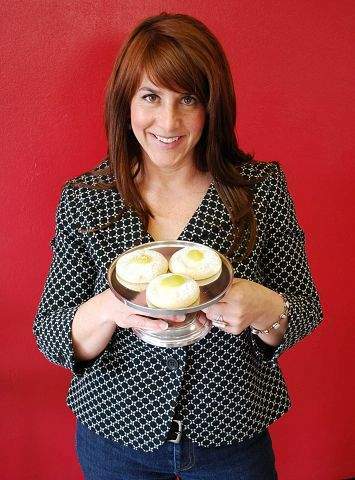 Tami Cromar holds a plate of her companys cookies in Salt Lake City. MINNEAPOLIS  A tiny Salt Lake City cookie bakery has discovered the giggly Pillsbury Doughboy can pack quite a punch. Tami Cromar, owner of My Dough Girl, agreed to find a new name for her retro-themed business after General Mills Inc., which owns the Pillsbury brand, told Cromar to stop using it because it believes My Dough Girl diminishes the value of its trademark Doughboy figure. Life isnt fair, so sometimes you just have to figure out a solution and move on, Cromar told The Associated Press by telephone Tuesday from her bakery, which features a dozen varieties of gourmet cookies, sold fresh-baked or as frozen dough. Cromar said she doesnt have the money to fight the worlds sixth-largest food company, which had global sales of nearly $16 billion in fiscal 2009. She said she started My Dough Girl in February 2008 by cashing out $10,000 from her IRA. She said she had $100,000 in sales last year and plowed every penny back into the business. She has eight part-time employees. Cromar said she tries to steer clear of efforts by her supporters and customers to shame General Mills. Those include a Facebook page called my dough girl vs pillsbury corporation, which has more than 1,770 fans. She said she doesnt want to rile the company even more. Golden Valley, Minn.-based General Mills said it objected to Cromars application to trademark My Dough Girl because it was too similar to existing trademarks for key products, including its iconic Doughboy. Cromar said she wasnt playing off the Pillsbury Doughboy when she chose the name for her bakery, nor was she even thinking about the doughboy nickname for soldiers in World War I. All her cookies, she explained, bear womens names like Audrey and Penelope that correspond on her website menu with World War II-style pinup pictures of the sort that used to decorate the noses of U.S. warplanes. She meant it as a tribute to The Greatest Generation and a throwback to a simpler time. Her company logo is styled in a similar vein. But none of the cookies is named Tami, which she said prompted her husband to remark: I know who my dough girl is. My dough girl is Tami. She said that was the origin of the name. Cromar said shes waiting to hear from the U.S. Patent and Trademark Office on her applications for a couple potential new names. She declined to disclose them because she didnt want to risk getting sued by another company. But she said she rejected one idea that worked off the World War II theme and the name of her mother, who taught her all she needed to know about baking. She said Betty Bomber was too close to Betty Crocker, another General Mills trademark. Cromar said she doesnt understand why General Mills chose to pick on her, given several other bakeries across the country have names that use versions of the word doughboy. She said she now just wants the food giant to leave her alone so she can continue baking. Even if we are a different name, our cookies are still going to be fabulous, she said.